I may suffer from Xenophobia and don't know it - but I don't think so. I remember the first time I had to transfer money into someone's bank account in South Korea for an order of shell buttons. I transferred an amount that I felt I could just "lose" in the leap to do some importing. Well, when the buttons didn't arrive, I was a little dismayed. I e-mailed the person and suggested that I would have to get in touch with the Canadian Trade Commission to track him down and get my buttons!! The next day a Fedex truck pulled up in front of my house and lo and behold there were my buttons - now it cost me - a Fedex shipment from halfway around the world is not cheap - but it worked out. I regularly transfer money into a bank account in Nepal for my silk yarns and fibre. I didn't know the person from Adam, at the time. However, we are now linked on FaceBook! I am in another one of those situations, however, it is in Canada; but the firm has to do a special order for me and I have to place the order, sight unseen, and hope that it is something that will work out. I just have to decide on the amount of money I am willing to lose in the plunge. There are few guarantees in life. We can try to hedge our bets and cover off some of the more obvious risks - but in the end it all comes down to a leap without a parachute or safety net - Geronimo!! I didn't use an "X" yesterday; but I thought a lot about the sign. I realized that in a few weeks an entire nation will decide their future with a collective "X." Scary when you think about it!! Looking beneath the surface (X-ray) begins by connecting with the surface. I like to think that my camera is my X-ray equipment. I try to find the meaning of "things" in compositions, in faces, in nature and anything else I may find of interest. Such as this old pink car that I see regularly at the market. 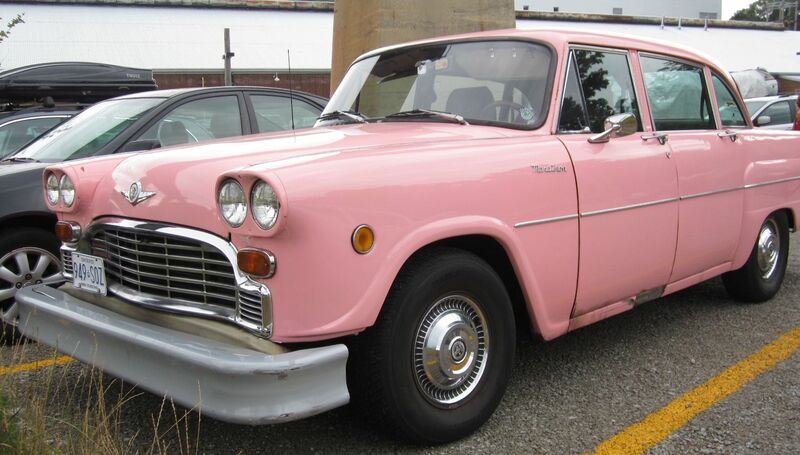 It is driven by a women in her 70's and I am very curious as to why it is pink. It is the same type of car (Checkers) that is used by taxi drivers in NY - theirs are yellow, though, not pink. Also, it's in relatively good condition, given its 30 odd years of service. There's a story here. A good reporter would tell us!! Today is a "Y" day. How about "yang," "yin," and "yen." I think there’s nothing wrong about being xenophobic. It’s a natural way of protecting ourselves from uncomfortable situations. Anyway, I’m glad that you took your camera and captured this wonder. It is rare to see a vintage car in pink color. Well, I had a girl friend that was able to find one with the help of her personal shopper. It saved her time and effort looking for that exceptional find. Anyway, I agree with Stelle, the character of lady behind the wheels must be very remarkable.